Picture, if you will, an underground 1920s cabaret club full to the brim with boozy carnies, babes and glitter, set in an abandoned fishmongers in central Perth. 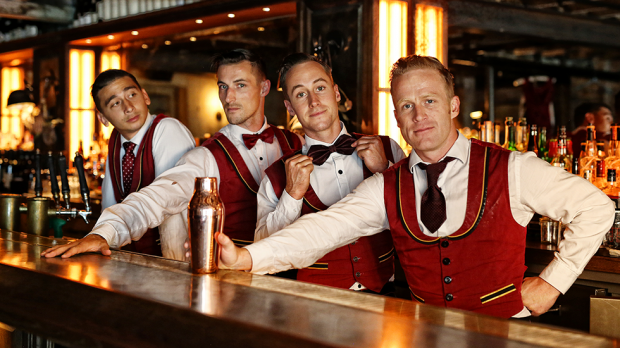 That’s it, you’ve arrived at Club Swizzle so you had better be ready to party like it’s 1929 and sip from an overfilled cup full of theatrical brilliance. 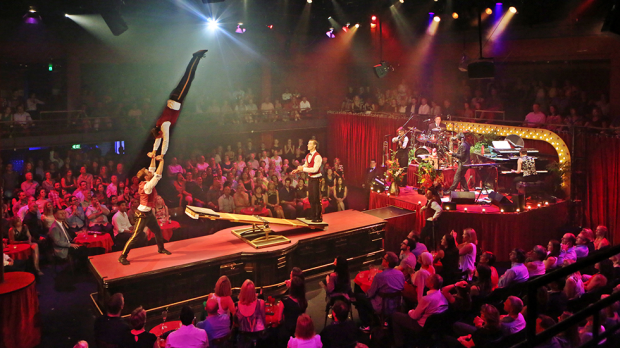 Nothing but the most unadulterated, hedonistic entertainment delivered by the renowned La Soirée, Club Swizzle is built on a solid foundation of joy and elation from woe to go. Greeted by performers from the moment the audience enters the club, and enthusiastically encouraged to truly drink it all in and drink up, the bar is indeed set very high for this fantastic creation by Brett Haylock. Thematically coherent, and magical at every turn, being Swizzled is nothing short of pure delight. The enigmatic Reuben Kaye is your host for the evening, as he smacks the audience in the face with his very specific brand of devilishly slick, slapstick diva, with more than a twist of bitter lemon coated in glitter and garnished with some of the heaviest lashes in the biz. Kaye is nothing less than stellar in a fabulous mix of comedic drama, bitchy sass and a soulful voice as he sings from the heavens, ablaze in sequinned glory. She’s a star, darling, and we eagerly await Kaye’s newly announced solo show on February 22 with which Perth has been blessed by Fringe and La Soirée. Mayhem abounds from the outset as the enormously talented Laurie Hagen bursts forth in a mash-up of brilliant burlesque with more than a touch of drunk clowning. Backed up with her virtuoso, mind bending, signature reverse strip, Laurie is worthy of all her awards previously bestowed and truly the second jewel in the crown of Swizzle. Not to be outdone, Yammel Rodriguez delivers a truly smoking, sultry lyra performance which is among the best ever to grace Perth stages. She is backed by the comedic stylings of Amy G’s roller clowning, followed later by the finest use of a kazoo witnessed to date. Dandy Wellington is snatched straight out of the history books and delivered to the stage, as he brings a touch of dignity to proceedings. Tap dancing and singing his way into hearts, he is a crowd-stirring good time. 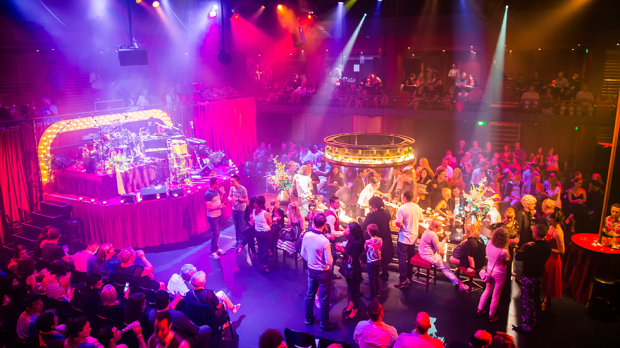 The ingenuity of Swizzle’s staging is nothing short of masterful – arrive early for the performance and you will drink from the bar which becomes the stage, resplendent in its glorious design with genius touches such as the uplights emerging from drawers in the bar as acrobats turn it into the performance stage set. It’s nothing short of spectacular. While the acrobatics are a magnificent way of tying the show together, there is nothing truly new and jaw-dropping presented by the troupe until late in the show, when there is suddenly a very real appreciation for the physical prowess offered up by the hardest working members of Swizzle. Club Swizzle is charmingly wicked, and a delectable cocktail of the delightful, served with a hint of saucy and a whole lot of mischief. It’s a really good time, so dive on in and be utterly intoxicated.